Scroll down below the picture for further explanation in your chosen language. B. Your stake for new bets (£4.27). You can also choose the stake type (for example, Stake, Liability, Tick Profit, etc). C. Left-click here to add a new LAY bet at 2.72, which should be instantly matched because there is money trying to BACK at that price. D. RIGHT-CLICK here to move the existing £4.27 LAY bet from 2.52 up to 2.56. There is no need to drag the bet, but you can drag it if you prefer. E. Left-click here to cancel this £4.27 LAY bet. F. Left-click here to add a new LAY bet at 2.44. 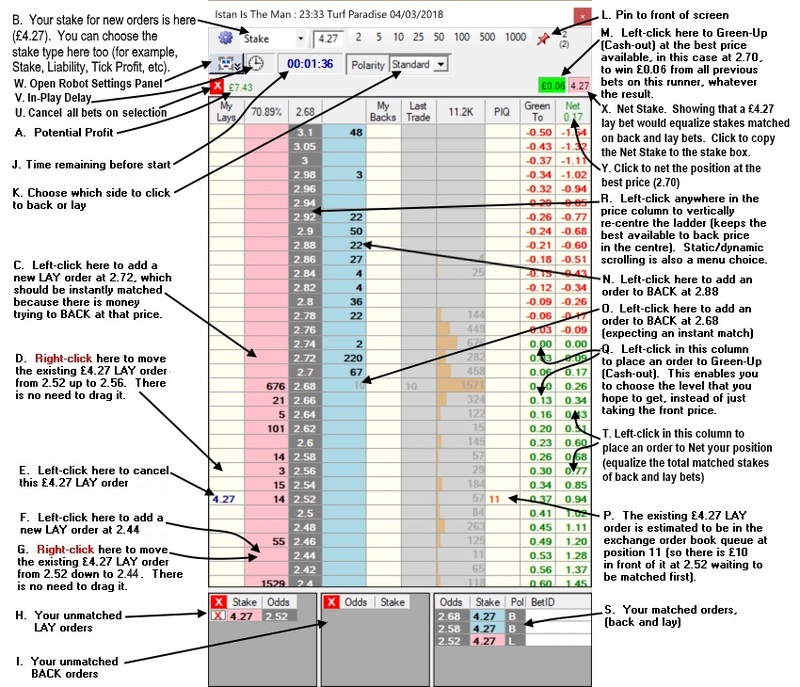 G. RIGHT-CLICK here to move the existing £4.27 LAY bet from 2.52 down to 2.44. There is no need to drag the bet, but you can drag it if you prefer. M. Left-click here to Green-Up (Cash-Out) at the best price available, in this example at 2.70, to win £0.06 from all previous bets on this runner, whatever the result. Q. Left-click in this column to create an order to Green-Up (Cash-Out). This enables you to choose the level that you hope to get, instead of just taking the front price. R. Left-click anywhere in the Price column to vertically re-center the ladder (keeps the best available to BACK price in the center). Static/Dynamic scrolling is also a menu choice. T. Left-click in this column to place an order to Net your position (equalize the total matched stakes of BACK and LAY bets). X. Net stake. Showing that a £4.27 LAY bet would equalize stakes matched on BACK and LAY bets. Click to copy the Net Stake to the stake box. IMPORTANT: All ladders are permanently set to one-click by default and this cannot be changed. Orders will be sent immediately when you click a cell.